January 19, 2017 by Matthew Rossi. Connecting IP cameras to an existing network is a tricky task for first timers. You'll have to understand a few principles to really be efficient at setting up your new IP camera system. Only use a desktop or laptop computer that has an integrated NIC (aka network port) and administrative rights for the operating system. Using a machine locked down by an IT Admin could cause unforeseen issues attempting to complete the project. Using a tablet with a USB attached NIC is not going to work either. The NIC must be built into your system and be recognized by the BIOS. Antivirus and Firewalls can block communications. Disable them temporarily if you have difficulty. You can use a Mac or a PC. Linux is not supported for this operation. Macbook Air and other laptops without an integrated wired NIC should not be used. There are different ratings for different cable types, giving different speeds. Cat5e supports less bandwidth than a Cat6 cable. While a Cat5e line might be enough for a couple 1080p cameras, using it as a backbone is not advised. Consider a highway. It is comprised of multiple lanes, allowing vehicles to travel from one location to another. How effective the highway is at its job depends on a ton of factors, but for this analogy, it can be broken down to the number of lanes and the number of vehicles attempting to travel in those lanes at a given time for a set distance. Network cabling is not much different in a broad scenario. We can compare a data packet to a vehicle, and the bandwidth of the cable to the number of lanes on the highway. However, the vehicles may take up more than one lane at a time due to their size. While you may have a 6 lane highway that can have six vehicles carrying a 1080p signal, the 4mp signals will take up two lanes and the 4K signals will take up 4 lanes. Needless to say, using a cable with a maximum rating of 125MB/s to carry the video to other network devices while you have 16+ cameras is not going to bode well for your transmission speeds. Don't cut corners on your install, make sure you run a good backbone. IPv4 addresses are given in dot-decimal notation. Each value is separated by the dot operator and is one byte in size. One byte is 8 bits. It takes 8 bits to make up an octet. IPv4 addresses are comprised of four octets. We really don't need to get into converting decimal to binary, just understand that in most scenarios the only octet that should differ from one device to another on a LAN is the fourth octet, and the values must be unique and between 1-254. Each IP address on a LAN must be unique. If two or more devices on the same network have the same address, each device with that address will turn off their NIC and stop communications on that network until the conflict is resolved. This is usually remedied by removing all but one of the devices with that address, changing the addresses, then reconnecting them to the network. Ideally, we don't want to go back and change the addressing scheme for the entire network just to get the data traveling correctly. Instead, you should analyze the network itself, and set the surveillance equipment to addresses that match your existing network. If your network has a default gateway address with anything other than 192.168.1.1 you will not only need to change the fourth octet of each device, but also the first three. If your network is managed by an IT department or some sort of managed services let them handle the addressing. 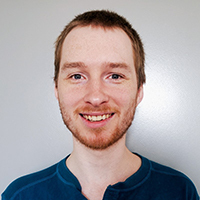 Otherwise, each device on your home or small office network should have the same subnet mask, and the first three octets of the IPv4 address should be the same throughout all of the devices. If your networks scheme is 10.1.1. 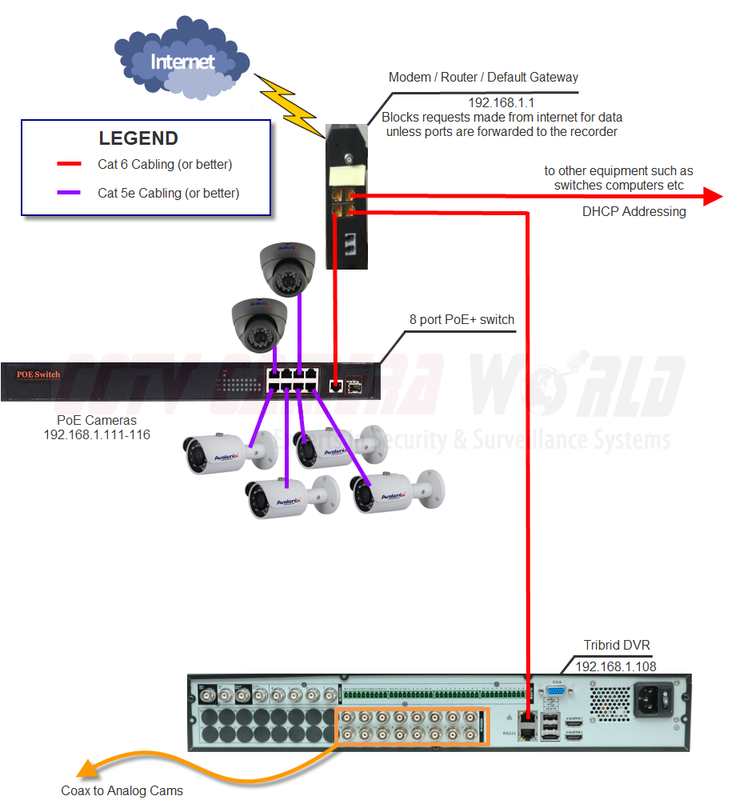 (x), and you add the NVR and cameras you received from CCTV Camera World to your network without any configuration, you will not be able to reach the devices via a computer or phone. Any network attached IP cameras will be subject to IP conflict as well as the NVR. You must set their addresses to match your network by attaching and configuring one device at a time. Essentially we want to try to keep traffic separated. We don't want to interrupt the camera's signal as this is what's being recorded. We also want to be able to use other devices for network traffic. Instead of pushing a backbone to its limit, we'll push traffic through different channels for different devices. Branching devices off in trees to keep the organization of the network is ideal. It helps tremendously during troubleshooting and allows for more bandwidth to the varying devices. Let's take a look at a few different network diagrams. Below in figure 2-1 we see a Tribrid DVR Network Diagram. Tribrid DVRs do not have integrated PoE ports as they need the space for BNC ports to be backward compatible with Analog and HDCVI. 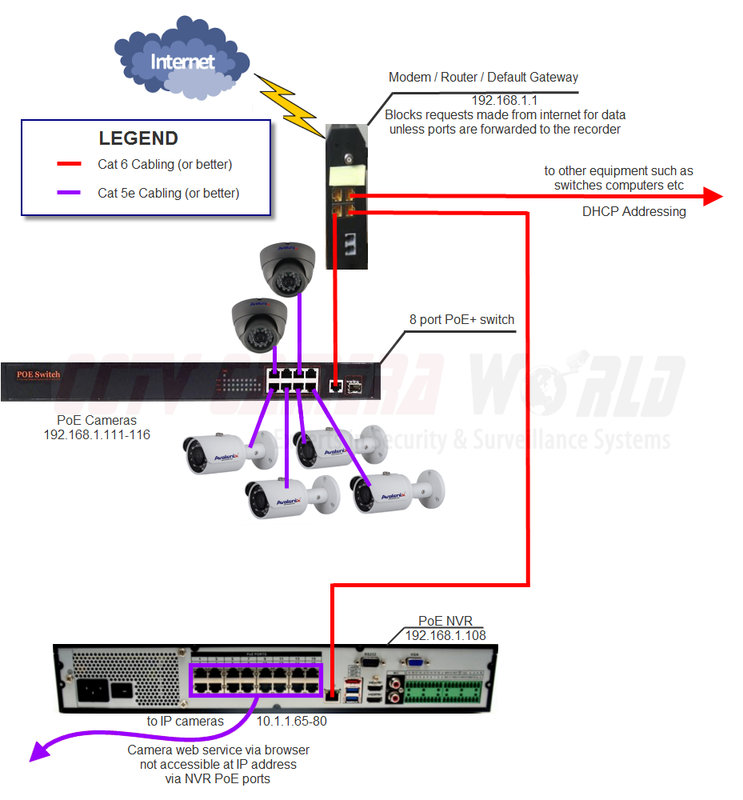 The IP cameras will need to be connected to the network with their own unique address that follows the networks scheme. Wiring the PoE switch improperly, or attaching computers to the same switch you are using to send large amounts of data to a recording device is asking for trouble. Make sure that the uplink port goes back to the network using a cable suited for the amount of bandwidth you will require. Let's take a look at a few different network diagrams. The192.168.1.X scheme of this network listed in all of the diagrams is a common one. It is a Class C private address. The first three octets are reserved for the network, while the last octet is used to address hosts. Your network configuration may be different. Please, do not just plug in the numbers from these images. You will need to think a little. In figure 2-2 you'll see an NVR without an integrated PoE switch. All of the cameras must be sent through a network to the recorder. 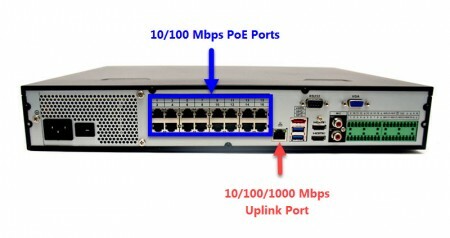 In figure 2-3 you'll see an NVR with integrated PoE ports. 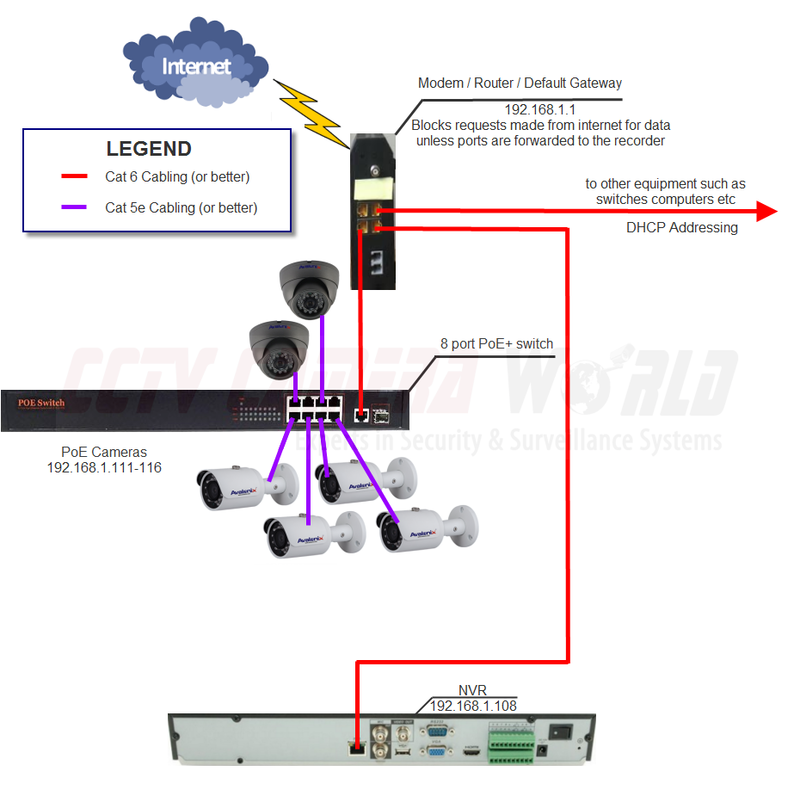 IP cameras can be attached to the integrated switch, added through the network, or both. Cameras that are attached to the integrated switch will not be accessible at their IP address given that they are on a different subnet on an internal network inside the NVR. They will communicate only to the NVR. If you want to reach the Web Service of a camera via a web browser, the camera must be attached to the network, with a matching IP address that fits your network to be accessible over the LAN. Think about the flow of traffic. It will always be busy where the cameras' video feed passes through. Provided all of the cameras are operational and set to a constant rate rather than a variable rate, there should be a consistent flow of about the same amount of data every second. That's just to record the cameras. If you want to monitor locally or remotely, the feed will have to travel back up the line and to whatever device you're monitoring from. This is why it is ideal to have a routing device that can handle the bandwidth on a full load. It's also important to understand the limitations of ADSL and other slow internet services like cable. While your internet speeds have no bearing on viewing your cameras over the LAN, the upload speeds do come into play when attempting to view the cameras remotely. The DVR or NVR must send the data to you through the internet. Let's say you have a 16 camera surveillance system with 16x 4MP cameras. With the bandwidth limitations imposed by cable and DSL internet providers, you'll never be able to view all sixteen 4mp cameras in full quality. In fact, with DSL you'll be lucky to view one camera in low quality. If you want to view a 4K camera in full detail, Verizon FiOS or Google Fiber will be required at that location or another comparable fiber optic service that offers good upload speeds. Our systems do provide a second substream that is of lower quality that you can use just to monitor a few cameras at a time using a slow cable modem 5Mbps upload speed connection. You can manage the resolution and bit rate of the second stream to suit your needs on your network. Don't expect a great image though. Your high-quality main-stream is still being recorded at its set resolution for you to be able to go back and review or export video in full quality. Not everyone is willing to move to a location with fiber optic internet service and pay for a good package, so there needs to be a way to get them the functionality of viewing. The Sub-Stream is the answer. Our goal is to provide you with enough information to be able to finish the install on your own. If you'd like hands-on assistance configuring your network, including port forwarding, you may make an inquiry using the Submit a Support Question form to create a ticket. We do charge to configure your network. please i have existing ip cameras working, and i bought new more cameras so i could add up to the existing ones, but the ip is conflicting with the network . how do i solve this? 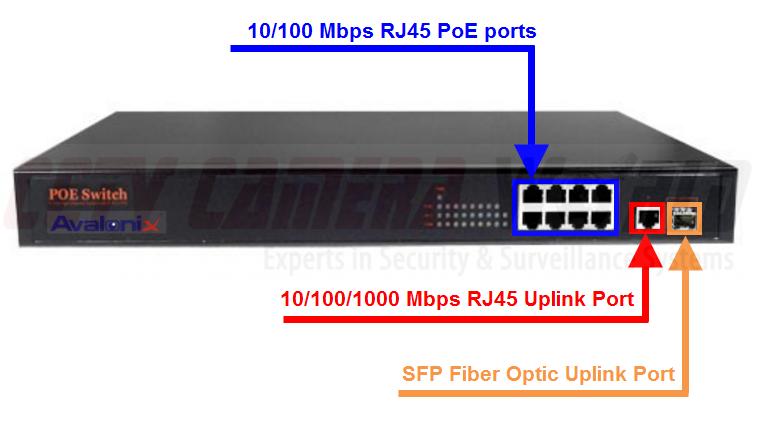 You would need to set each camera on a different ip address that matches your subnet IP scheme. use MAC Address reservation in your router .. assign ip address to each mac address of your ip cameras ..
the existing cameras are Av-tech with the NVR, while the new ones just new brand (INFINITY- PLUS). they are 3mp while the existing ones are not up to 2mp. i have configured and they work on my computer, but when connected to switch they don't come up at all. no conflicting ip address. what else will i do? The AVtech unit may not be compatible with your new cameras. 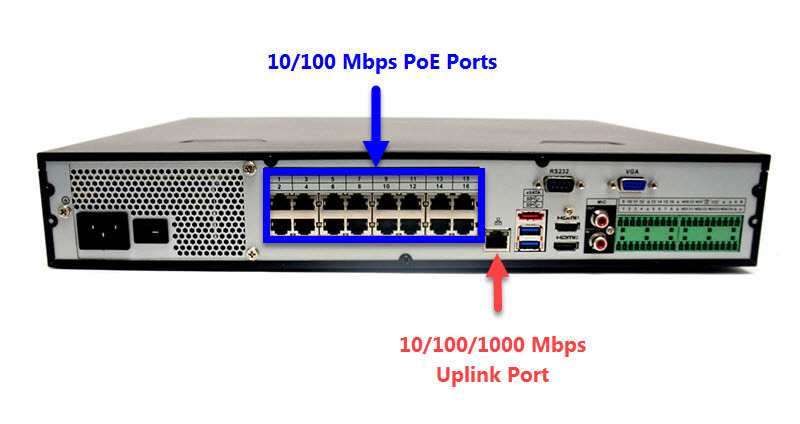 Can you connect the POE switch uplink to an available POE port on the NVR rather than connecting from the router/modem? You could but you are going to create a bottle neck as the PoE ports are 100mbps. 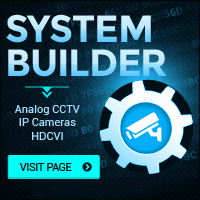 Can an IP camera work without a DVR or NVR? I only wanted the cameras so I can view everything from my phone maybe through a special app.